The October 18 kickoff of the three-month grand opening celebration for the $6.2 million Bradenton Riverwalk renovation project will help shape what's next for the City's revitalization in the shared vision of Mayor Wayne Poston, the Bradenton Downtown Development Authority (BDDA), Realize Bradenton and private community partners. 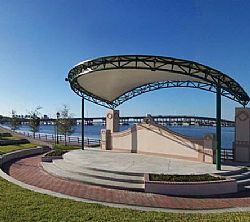 The 1.5 mile-long Riverwalk park includes a kayak launch, beach volleyball, a fishing pier, a rowing venue, a skateboard park, a tidal discovery zone, shaded areas to read or lounge, an interactive splash fountain, and a 19-slip day dock. It serves as a gallery of more than 20 pieces of outdoor art with interactive sound sculptures, history and beauty to match the natural river setting. Centrally located in the park is a covered Pavilion and Event Area, which will be the site for concerts, festivals and other private and public events. The festival site overlooking the Manatee River can accommodate up to 2,000 people, says Dave Gustafson, executive director of the BDDA.